When I listened to Cary Elwes narrate As You Wish: Inconceivable Tales from the Princess Bride last Novemeber, I loved it. The Princess Bride is one of my favorite movies ever. He talked about the movie making process, life on the set, and what it was like to work with all of the different actors. It was like a love letter to every Princess Bride fan. My first thought when I was done listening to it was, I wonder if Carrie Fisher has written anything about filming Star Wars? And if so, did she narrate the book? I did a quick search and to my surprise and delight, realized The Princess Diarist was scheduled to be released in a matter of days. What timing. I should probably mention that Star Wars (now titled Episode IV: A New Hope) is indeed my absolute, number one, most favorite movie ever. And Princess Leia is now and will forever be my princess. I was planning to pick up The Princess Diarist after Christmas. I didn’t have time to read it before the holidays, and I thought maybe someone in my family might see it and think it was something I needed for Christimas. (Of course, they didn’t, so I bought it for myself right after.) I put the audio book on hold and figured with my number in the queue it would come up sometime in January. I didn’t want to just read Carrie Fisher’s book. I wanted to hear it in her own words and style. Then the unthinkable happened. Carrie Fisher had a heart attack right before Christmas. And then she passed away a few days later. Our princess. My princess. 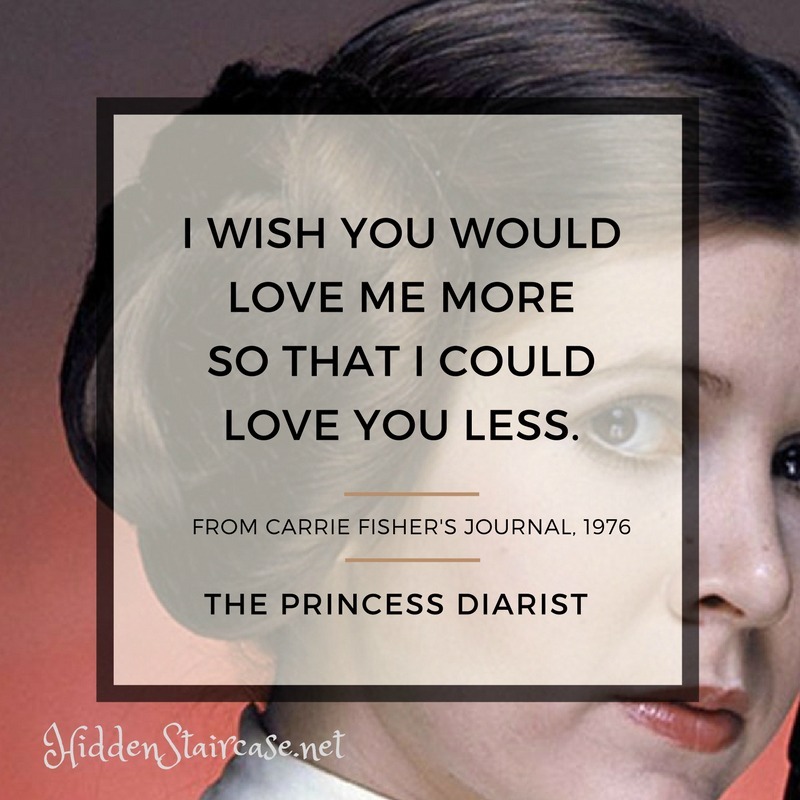 A few weeks ago, it was with a heavy heart that I listened to Ms. Fisher narrate The Princess Diarist. She wrote the book after discovering her long-lost journals that she kept while filming Star Wars. I thought the journals would be similar to Mr. Elwes recollections of his experience—a running memory of stories from the set. An insider view on the making of one of the most iconic movies in film history. I couldn’t have been more wrong. Instead, they are the musings of a 19-year-old girl who has fallen for an older, married man. The book is set up in three unofficial parts. In the beginning, Ms. Fisher writes about events leading up to and the filming of Star Wars. The middle is her journal entries (I believe excerpts, and not the journals in their entirety), narrated by her daughter Billie Lourd. The remainder of the book focuses on life (and Leia) after filming. Overall, Ms. Fisher’s book is funny, insightful, and at times heartbreaking. Sometimes it’s all three at once. The diary entries themselves are beautiful. Some are short little rhymes, and others full length poems. She writes stories and little bits of dialogue. The entries are funny and sad, and she constantly looks inward at herself. They definitely show that early on Ms. Fisher had a gift for writing and expressing herself. As for the book itself (the parts before and after the journal entries), The Princess Diarist is simply Carrie Fisher. It’s honest and humorous. And at times a little wandering. Ms. Fisher tells it like it is, with no holds barred, particularly when talking about herself. Listening to the audio book and hearing her tell her story was wonderful. 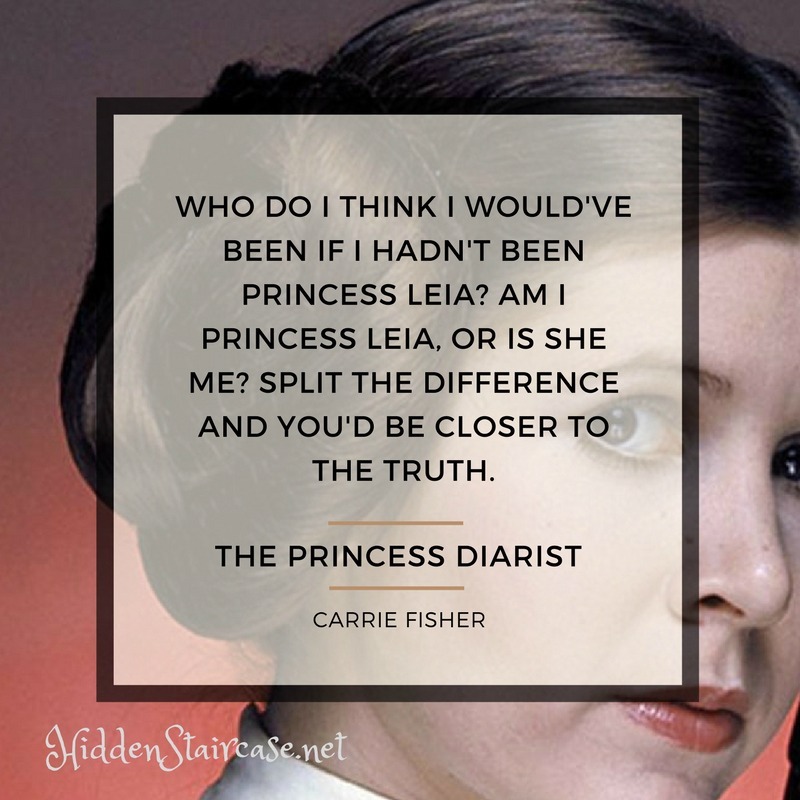 The Princess Diarist is not all about the diaries and what went on behind the scenes, that’s just the first half of the book. In the second half, she muses about her relationship with Princess Leia—the highs and the lows that being Leia has brought her. I especially enjoyed hearing her tales of meeting fans at autograph signing events. RIP Carrie Fisher. The Force will be with you. Always. ← Death of a Ghost. Great to be back in Lochdubh. This is a wonderful review and the topic is so apropos; I believe I would like to read this. I really want to listen to this as well. I am waiting for my library to get the audio in. I know it will feel different knowing she just passed . Glad you enjoyed it. Great review! Listening to it is the way to go. I love to listen to authors read their own memoirs. Especially ones with humor. It’s just that much funnier. Definitely a bittersweet read for sure. I hope you like it! It’s so hard to believe that Carrie Fisher is gone but this book sounds like an amazing legacy. I love that you really got a true sense of her. It sounds amazing and I must get it on audio. I also need The Making of Star Wars! I hope you like it! I plan on reading more of her books for sure. The Making of Star Wars is excellent. I haven’t read the whole thing, but I’ve enjoyed what I’ve read and it has great photographs throughout.